I had the chance to sit down with Sourabh Ahuja, CEO of Schoold. In this interview, you will learn about the Schoold app, his passion and dedication behind its development, and how it is poised to be the next Amazon for education opportunities. 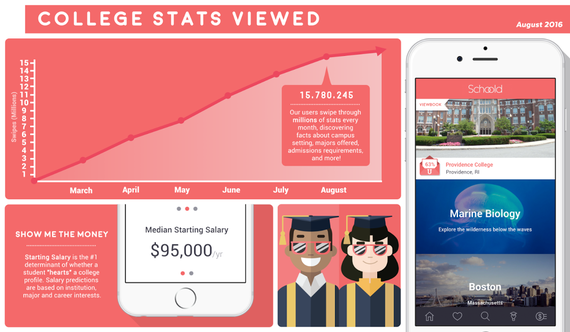 Today, Schoold is the fastest growing app in higher education with 1,000,000+ new installs in 2016 and an unprecedented 4.6/5.0 rating in the Apple store. Please tell me about your background, Sourabh. How did you get here today? Growing up in India, I knew that I wanted to study in the United States but the application was incredibly confusing. I ended up at a school in Oregon to get my Master's in Computer Science. Honestly, it wasn't the right program for me - I fell for a good sales pitch from an international recruiter with an agenda. But I made the best of it and after graduation, landed a coveted job with Glu Mobile. I spent ten years building some of the most popular games and mobile apps out there: Guitar Hero, Monopoly, Transformers, World Series of Poker, Deer Hunter, Kim Kardashian Hollywood... dozens more. You've likely played games that I built. What drew you toward the education field? I loved building entertaining apps, and I was good at it... but wanted to do something redeeming. I started work on Schoold when my wife was pregnant with our first child - in some ways that was my inspiration: I wanted to make the world a better place for future generations. Access to education is incredibly important and I know firsthand what it feels like to go to the wrong school. It's shocking to me that in a country as great as America, the average ratio of school counselors to students is 1:472; 73% of schools lack a dedicated college counselor. We can bring transparency through technology. And by applying my gaming background, I figured I can make it fun - this ensures students utilize the app to unlock their full potential. Let's talk about Schoold. Schoold is the #1 USA college search and future planning tool, with over 500,000 downloads in its first month. Can you give us a brief overview of the app? Schoold is the fastest growing app in higher education with 1,000,000+ new installs in 2016 and an unprecedented 4.6/5.0 rating in the Apple store. Students describe Schoold as "sleek, sensational, surprising;" "addictive and super informative;" "my new best friend. "High school counselors report that Schoold "turns months of researching colleges into a 20-minute search." We have 3,125 university profiles for students to browse and gain access to data. We also have free counseling - our counselors don't just help students discover schools, they help them uncover educational interests and professional goals. Among all the noise in the edtech ecosystem, what is the key differentiator between your app and other college and career-planning apps? Our core tenets/values are transparency, accuracy, objectivity, simple and fun, and equality... We're much more mission-driven than other college and career-planning apps. Most sites feature sponsored universities and jobs, driving students to programs that aren't right for them. You won't find any of those sneaky tactics in the Schoold app. Schoold pulls together data from thousands of colleges, including graduation rates and salary projections. However, it also provides a vast amount of resources and hard-to-find information. What are three unique tools within the app that you believe make it so attractive for students and parents? Can you share a student success story with us? I think that our hundreds of glowing app store reviews are the best source of success stories. We provide free counseling to thousands of students - they can message our counselors and admissions experts directly from their phone. Users have been incredibly grateful, saying Schoold helped them find their dream college. We've also opened a lot of eyes to the real cost of attending universities - too often, students get scared away by sticker prices. We adjust tuition based on family income and background, estimating what each students will get in financial aid, scholarships, work study, etc. Most applicants don't realize that, if they have the grades and scores, attending schools like Stanford and MIT can actually be cheaper than state schools because of all the financial aid available. How can students take part in any social media offerings or contests Schoold runs? They just need to install the free Schoold App on their iPhones, Android or Kindle. We feature opportunities in their home feed, using a proprietary data analytics engine to personalize the content and offerings available for them. We also post about the contests on our Twitter, Instagram and Snapchat channels: Schoold_App. How does Schoold benefit institutions and where can they go to learn about joining the community? Schoold partners with universities to help them engage with students directly through our app. Every year universities spend $2B+ recruiting students via outdated methods such as direct mailings, email campaigns, and college fairs. 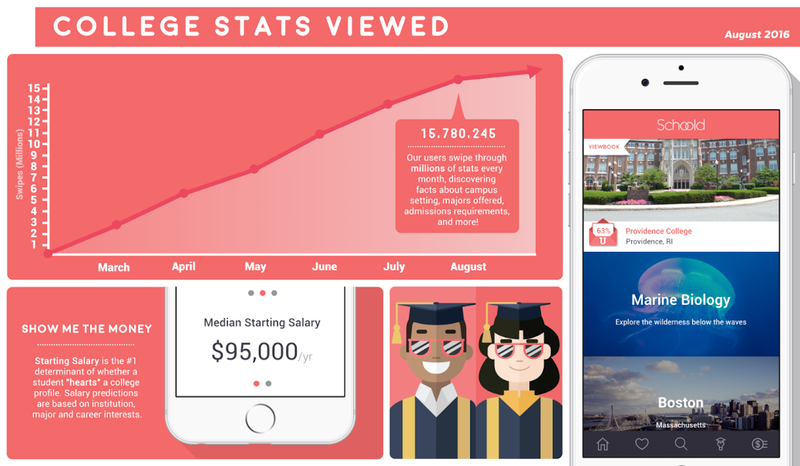 We're building mobile versions of one of the university marketing staples--Viewbooks-- and modernizing them for the current generation of mobile users who expect highly engaging, easily-digestible, visually-stunning content. It's a wildly affordably alternative. We're hoping they pass along some of these savings to their students via financial aid. Universities can contact our Chief Marketing Officer at: Lydia@schoold.co to learn more. Where can students and parents download Schoold? We're the top higher education app on iPhone, Android, and Kindle... Just type "university" or "college" into the store and we'll be one of, if not the, first result. You can also visit http://social.schoold.co to download the app and watch a quick demo. Please share anything else you'd like to tell us about Schoold. What does the future look like right now? We started by focusing on undergraduate institutions, but we're expanding to study abroad campuses, international universities, graduate schools, online classes, etc. Schoold's mission is to become the Amazon for educational opportunities. I am honored to be an official education and edtech thought-leader on LinkedIn, with over 40,000 followers in my field. I am the founder and senior editor of EdNews Daily. We interview and work with education startups, teachers, advocates, Shark Tank winners, entrepreneurs, innovators, nonprofits, and education game-changers. Some of our partners include Prepexert.com from Shark Tank, EdTechUpdate, Milewalk Academy, MyColLife, Edcast.com and our newest partner, BigMarker.